-Messenger photo by Chad Thompson Scott Hatton, senior pastor, left, and Gabe Casciato, pastor for family life, pose together inside the sanctuary at CrossWay Church in Fort Dodge recently. Dressed in an Iowa Hawkeyes sweatshirt and stained up blue jeans, Gabe Casciato might not look like a pastor at first glance. But his strong desire to serve people in the Fort Dodge community is evident through his actions. 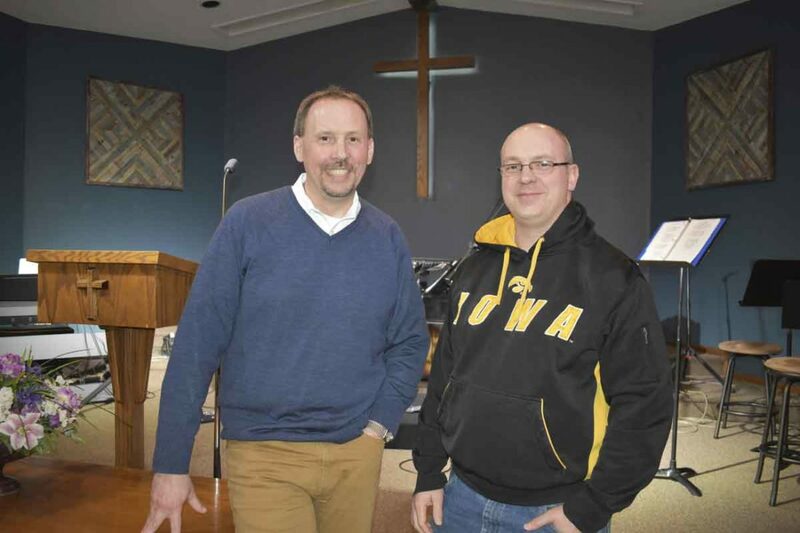 On Feb. 23, Casciato didn’t hesitate to help a complete stranger on the outskirts of Fort Dodge, according to Scott Hatton, senior pastor at CrossWay Church, 3058 10th Ave. N., formerly named First Evangelical Free Church. That’s when Casciato answered the call on a Thursday afternoon. “Pastor Gabe went out there and crawled under this guy’s car and helped him change a tire,” Hatton said. The adventure explained the stains on Casciato’s jeans. The man Casciato helped spoke little English, but that didn’t bother Casciato a bit, he said. “It was fun,” Casciato said. 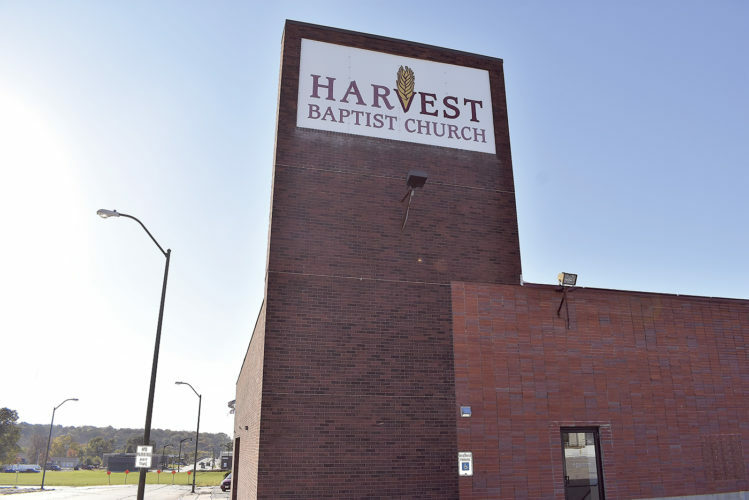 Hatton admitted the church isn’t in the automotive repair business, but lending a helping hand in that situation is an example of the church’s mission of being a good neighbor in the Fort Dodge community. “It was really neat to be in a position where someone calls and for him to get out there and really serve in an extremely tangible way to help a guy change a flat tire on the side of the road,” Hatton said. Casciato, a pastor for family life, also serves as a wing chaplain at the Des Moines Air National Guard Base. There, Casciato is responsible for all the religious programming and care of the troops stationed at that location. Casciato, 39, was recently promoted to lieutenant colonel in the Iowa Air National Guard. Casciato served in the Middle East as a chaplain from 2009 to 2010. Providing protection and care for the troops was what Casciato was tasked with. Casciato would eventually transition into becoming a pastor at CrossWay Church. He joined CrossWay Church in December. 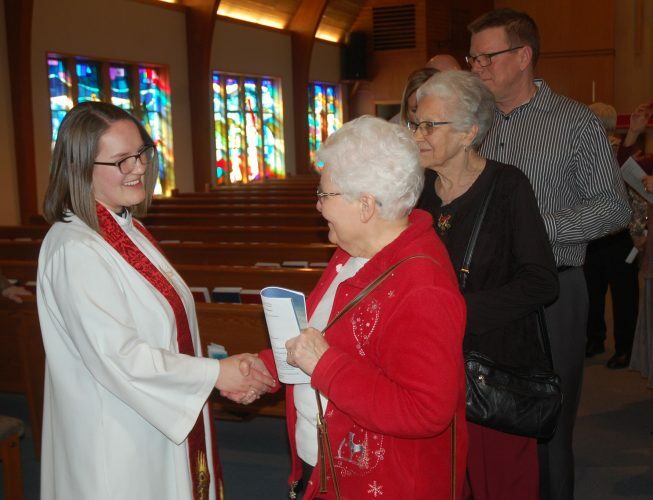 The church, which has been in Fort Dodge since 1964, changed its name from the First Evangelical Free Church to CrossWay Church in January. It was a move to hopefully make the church more understandable and relatable to people, Hatton said. 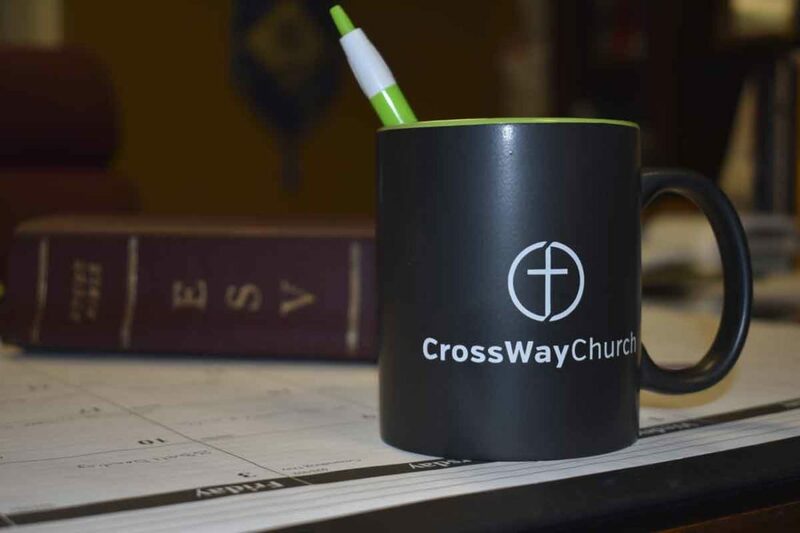 CrossWay is a name that fits with the church’s message, Hatton said. 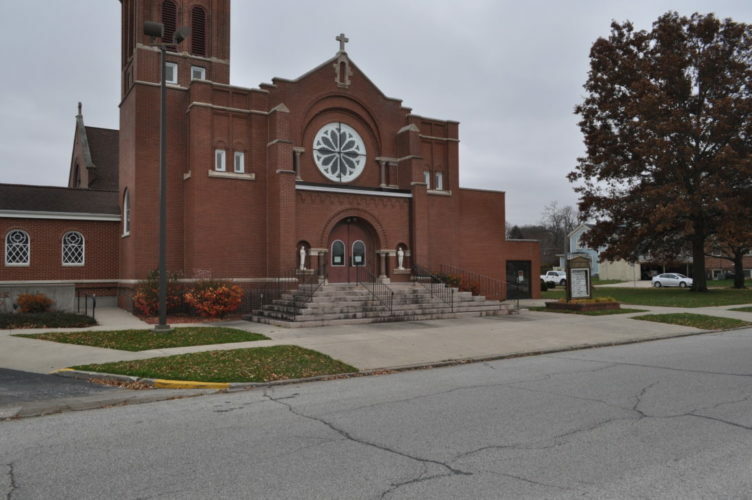 Community Christian School, which historically had been connected with First Evangelical Free Church, is not officially associated with the church anymore. However, many people are associated with both the church and the school. 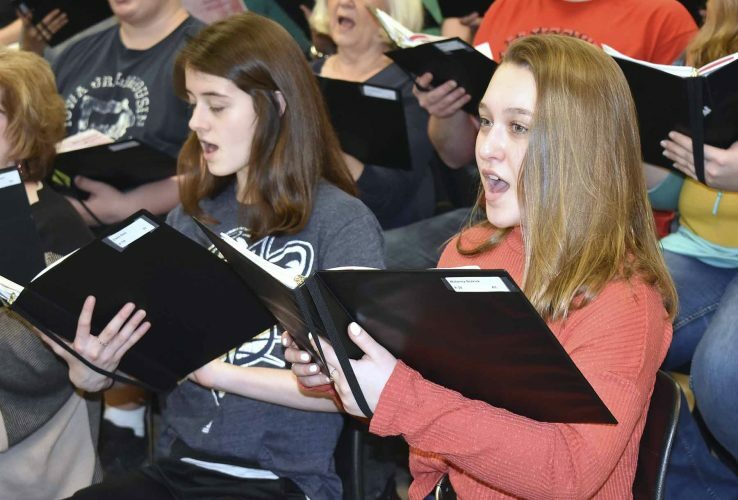 Feed My Starving Children, a worldwide organization that sends food to places across the globe to help children that don’t have enough food to eat, is another area of involvement the church prides itself on being a part of, Hatton said. CrossWay also has a presence at the Fort Dodge Correctional Facility, where it sends a group called Faith Studies to meet on Thursday nights. “They have about 30 to 35 guys that meet Thursday nights for worship and Bible study,” Hatton said. Hatton said he and a worship band also visit from time to time to play music. Casciato said he just wants to continue his work of helping people through difficult times.